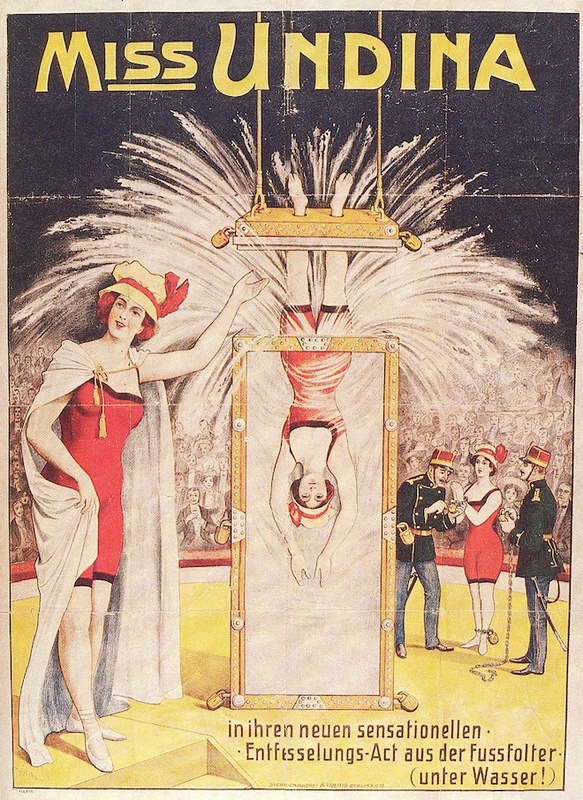 Not long ago I did a post about Miss Undina, the German imitator Houdini shut down in 1912 for lifting his Water Torture Cell escape. I included the famous and familiar black and white Miss Undina poster image, first published in Gibson's Houdini's Fabulous Magic (1961). But now thanks to Chuck Romano of Chuck Romano Magic, here's the poster in its original full color! Apparently this color image has been hiding in plain sight. Chuck explained to me that he discovered it in Time Life's The Encyclopedia of Collectibles: Lalique to Marbles (1979). He tells me this find even surprised the late Sidney Radner. This is really awesome because I don't believe I've ever seen this poster in color before. Even Tachen's seminal MAGIC 1400s-1950s reproduces this poster only in black and white. Truly the biggest find of the year, and we're just started!